R&D Magazine recently announced the 2011 R&D100 award winners, and this year’s awardees included several names familiar to JAAS readers. The “Array Detection Technology for Mass Spectrometry” was identified as one of the 100 most influential technological achievements/products of the year. The array detector (also known as the Focal Plane Camera) is a solid-state monolithic integrated circuit device designed specifically as adetector for mass spectrometry. It was first employed for atomic mass spectrometry (ICP-MS), but has more recently found other uses in ion mobility spectrometry and molecular mass spectrometry. A commercial version of the detector can be found in the new SPECTRO MS instrument. 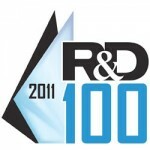 Since 1963, the R&D 100 Awards have identified revolutionary technologies newly introduced to the market. The Awards, widely recognized as the “Oscars of Innovation”, identifies and celebrates the top high technology products of the year. The Federation of Analytical Chemistry and Spectroscopy Societies (FACSS) has renamed their annual scientific conference. Starting in 2012, the meeting will be known as SCIX- The Great Scientific Exchange. FACSS is an organization of scientific societies banded together to promote Analytical Chemistry: The American Chemical Society Division of Analytical Chemistry, the Royal Society of Chemistry, the Coblentz Society, the Americal Society for Mass Spectrometry, the ANACHEM Society, the International Society of Automation Analysis Divisiton, and the Society for Applied Spectroscopy. For the last 38 years, FACSS has held an annual international meeting known informally as the ‘FACSS Conference’, where all member societies contribute to a scientific program that showcases a wide breadth of analytical chemistry topics. The FACSS member societies have recently expressed a wish to expand this annual conference- and the first step in the expansion was to name the annual meeting. The first SCIX conference will be held in Kansas City, MO from September 31-October 5. More information can be found on the FACSS website (http://www.facss.org) or on the new SCIX website (http://www.sciexconference.org). Of note, a program preview of the new SCIX conference is available online: (http://scixconference.org/scix2012.html). Current and former JAAS editorial board members and frequent JAAS contributors Professor Gary Hieftje of Indiana University and Professor Joseph Caruso of the University of Cincinnati have been named Fellows of the American Chemical Society. The American Chemical Society recognizes the outstanding achievements and significant contributions of these individuals through this honor. ACS fellows are named from all branches of science and professional endeavor. Congratulations Fellows! 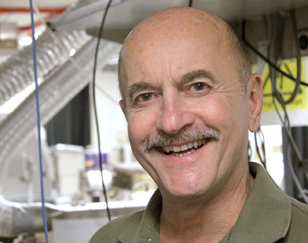 Professor David Hahn of the University of Florida has won the Lester Strock Award for 2011. 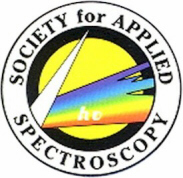 The award is presented by the Society for Applied Spectroscopy in recognition of significant and sustained contributions to atomic spectroscopy. 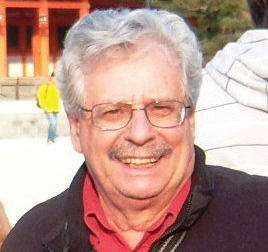 The award panel cited in particular Professor Hahn’s contributions to the fundamental understanding of plasma/analyte interactions in Laser-Induced Breakdown Spectroscopy. Congratulations Professor Hahn! 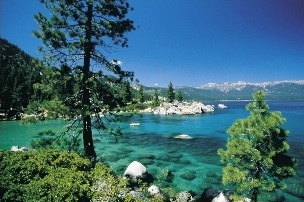 The 2011 meeting of the Federation of Analytical Chemistry and Spectroscopy Societies (FACSS) will be held in Reno, NV from October 2-6. The submission deadline for abstracts that will be considered for oral presentation is April 30 (Today! )– those abstracts that are submitted after the deadline will be presented as a poster. Abstracts can be submitted online at http://www.facss.org. …and contributed sessions will be added to the program as space allows…so if you do not see a program area above that fits your research focus, don’t let it stop you from submitting a paper! The early registration deadline for the Third International Symposium on Metallomics conference is April 30. Metallomics is to be held in Munster, Germany June 15-18, 2011 and sister journal Metallomics has announced a special issue themed around the conference. The submission deadline for the special issue July 15, 2011. More information can be accessed online at: http://www.metallomics2011.org. deadline to April 20, and late-breaking poster presentations are still being accepted. The preliminary program is now online and can be accessed at: http://www.tracespec2011.com. 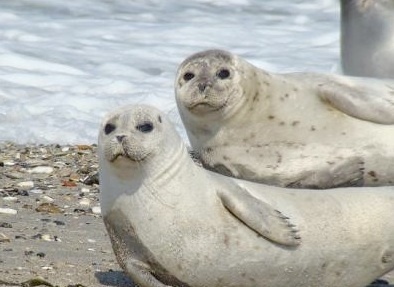 “First health and pollution study on harbor seals (Phoca vitulina) living in the German Elbe estuary“, Antje Kakuschke, Elizabeth Valentine-Thon, Simone Griesel, Juergen Gandrass, Octavio Perez Luzardo, Luis Dominguez Boada, Manuel Zumbado Peña, Maira Almeida González, Mechthild Grebe, Daniel Pröfrock, Hans-Burkhard Erbsloeh, Katharina Kramer, Sonja Fonfara and Andreas Prange., Marine Pollution Bulletin,60(11), 2019-2086. 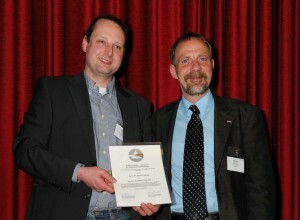 (Carsten Engelhard) Dr. Daniel Pröfrock has been named the 2011 Bunsen-Kirchhoff Award winner. Bunsen-Kirchhoff Award winner Dr. Daniel Pröfrock with Prof. Dr. Detlef Günther (Picture: Johannes Stadler, CC-BY). 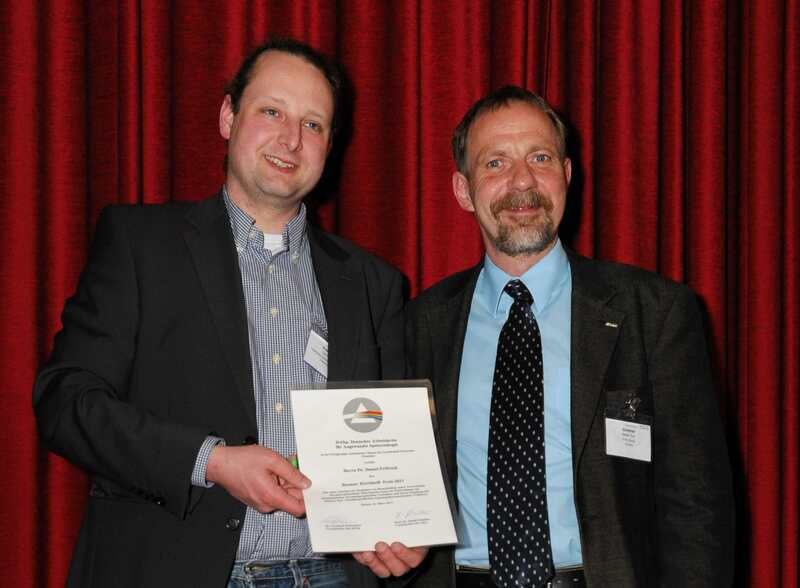 Prof. Detlef Günther, JAAS Editorial Board Chair and member of the award committee, presented the prize on behalf of the German Society for Applied Spectrocopy (DASp) during the ANAKON conference dinner. The ANAKON conference was held March 22 – 25, 2011 in Zurich, Switzerland. Every year the Bunsen-Kirchhoff Award is given to an outstanding young scientist in the field of spectroscopy. The prize includes a monetary reward of 2.500,00 €. Daniel presented an award lecture entitled “Elemental speciation in environmental and life sciences utilizing heteroatoms, miniaturization, and mass spectrometry”. He is a scientist in the Marine Bioanalytical Chemistry Department of the Helmholtz-Zentrum Geesthacht Centre for Materials and Coastal Research (HZG, http://www.hzg.de). 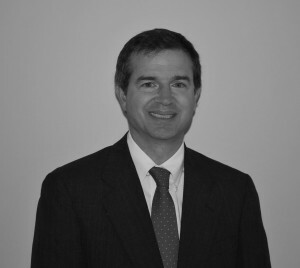 His research interests include trace element analysis and elemental speciation in the marine environment, as well as development and application of hyphenated techniques for marine bio analysis. The 13th Workshop on Progress in Trace Metal Speciation for Environmental Analytical Chemistry is to be held in Pau, France from May 18-20, 2011. Sponsored by the University of Pau, the European Virtual Institute for Speciation Analysis (EVISA), the International Association of Environmental Analytical Chemistry (IAEAC), and the CNRS, the meeting seeks to focus on aspects of speciation analysis that relate to speciation and bioavailability, direct and in-situ speciation analysis, speciation of metal species in colloidal and nano-materials, metal speciation in the environment and legal aspects, speciation in industrial applications, new analytical strategies for metal speciation including isotopic information. 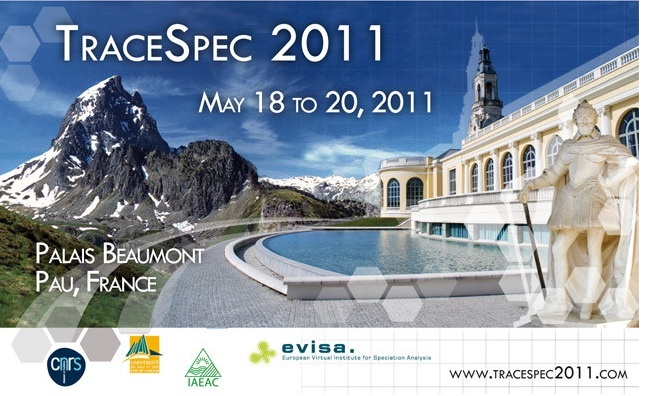 Abstracts can be submitted online at: http://www.tracespec2011.com/ (deadline is March 15).